Memories in the form of feathers, lost on the winds that separate the many worlds. A wizard, a ninja, a boy, a princess and Mokona: all are connected by inevitability and the many works of CLAMP. When Cardcaptor Sakura first appeared on the world's television screens, it was seen as a kind of Pokémon for girls. 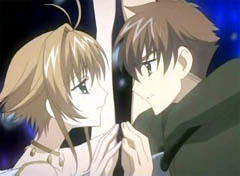 Despite being heavily cut for English-speaking viewers, by the time the second theatrical movie reached the U.S., Sakura and Syaoran had become one of anime's most popular couples. 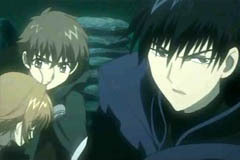 Animefringe featured back in August 2003 CLAMP's new manga series, a sequel of sorts to Cardcaptor Sakura called Tsubasa RESERVior CHRoNiCLE, starring Syaoran and Sakura. 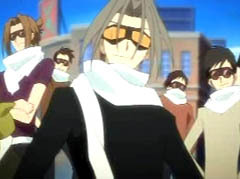 Sometime later, the series was slated to make the jump into animation as a series. Last month, this all came to pass when the first episode of Tsubasa Chronicle aired on Japanese television. They dropped Reservoir from the title; Tsubasa Chronicle makes much more sense. Just in case you were wondering, the Japanese word tsubasa means 'wings,' which describes the central quest in the story perfectly. 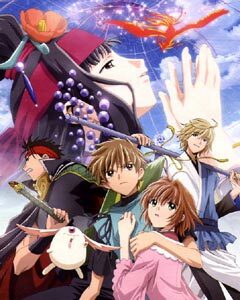 What you have to understand first about this series is that even though it stars Sakura and Syaoran, they are not the same people that we see in Cardcaptor Sakura. Both of them are older, and the world they live in is not our Earth. The animation for the new series was done by Bee Train (not Madhouse), and none of the original seiyuu are reprising their roles, as if to categorically remind viewers that while the names are the same, these are not quite the same people that we remember. We first met Sakura when she was a Cardcaptor, a klutzy girl who said hoe a heck of a lot and was constantly late for school. In Tsubasa Chronicle, she is a princess and heir to the desert land of Clow. Her bother, Touya is the king (he still thinks Syaoran is a brat though) and they are the children of a man who looks an awful lot like Clow Reed. Sakura still has a slight 'thing' for Yukito, who in this world is a priest and her brother's advisor. Syaoran, meanwhile, is now an archaeologist and the adopted son of a man named Fujitaka (Sakura's dad in Cardcaptor Sakura) who died during an excavation. And what of Sakura's best friend, Tomoyo? Well, she's also a princess and rules the feudal land of Nihon (which happens to be the Japanese word for Japan). This is where we meet Kurogane, the strongest fighter in the land. He's arrogant, yet devoted to Tomoyo, but he has once again broken his Princess' command not to kill people 'needlessly.’ So she decides that he must learn a lesson and sends him to another world. Tomoyo also places a curse upon him that each time that Kurogane kills, he will become weaker. We also meet Fai, a wizard from the land of Ceres, who has bespelled Lord Ashura from RG Veda. He explains to his companion, Chii (yes, that Chii) that he must leave their world to make sure that Ashura remains sleeping (those of you who are reading RG Veda will understand this is a good thing). Confused? Don't worry, previous knowledge of CLAMP's other series isn't a pre-requisite for watching Tsubasa Chronicle, but if you are a fan, then you're going to get a kick out of this series! Unfortunately, all is not well in the land of Clow. Sakura is drawn to some mysterious ruins, and her magic causes a rift between worlds, with men appearing from nowhere and beginning to invade. Great wings have appeared on Sakura's back, and the feathers are scattered when Syaoran leaps to save her, leaving her comatose. Two strangers, a woman and a somewhat familiar man with a monocle watch from another world, commenting that things have only just begun. Yukito sends Syaoran and the sleeping Sakura to 'our' world, more precisely to the Dimension Witch Yuko Ichihara, and so their journey begins, but not without a price. Even if Sakura regains all her memories, her relationship with Syaoran will never be the same again. Yuko demands compensation from each person in return for granting his wishes. Fai wishes to go anywhere but his own world, and so he gives up the markings on his back. Kurogane wishes to return to 'his' Japan, and so he forfeits his katana, and for a moment we see a comedic side to Yuko that fans of the manga XXXholic will have been waiting for. Finally, Syaoran must forfeit his relationship with his 'most important person' -- Sakura. If she awakens, even with all her memories returned, none of those that include Syaoran will exist. But of course, most anime series are not complete without the cute sidekick and Tsubasa Chronicle is no exception. Sadly, it’s not Kero-chan. Mokona Modoki, last seen in Magic Knight Rayearth, now strings entire sentences together, and as well as being extremely cute, Mokona also happens to be the gang's method of transportation between the worlds. It (Mokona doesn't seem to have a gender) sprouts wings and swallows our travelers. Mokona is also obscenely chirpy, and it provides the 'next episode' dialogue, complete with the catchphrase 'doki doki' (the sound of a heart beating with excitement). There are actually two Mokonas in the series. 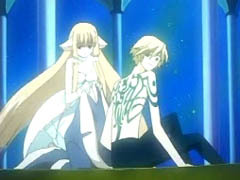 The white one goes with Syaoran, while its black companion remains with Yuko, enabling them to communicate with each other. The second episode ties in with the end of the first tankouban of the manga, albeit without the comedic presence of Sorata and Arashi of X fame (rest assured, X fans, they do appear in episode three). Syaoran is forced to do battle with his kudan, who looks a heck of a lot like Rayearth from Magic Knight Rayearth in the world of the Hanshin Republic. Whoa! With so many crossovers in such a short space of time, you would suspect Tsubasa Chronicle of being nothing but self-promotion, but you must understand this is not just a whimsical fancy on the part of CLAMP. Each one of these reincarnated characters is present for a reason, from Arashi and Sorata to the 'other' Touya and Yukito who work as waiters in Hanshin. There have been over ninety cameos over nine volumes in the on-going manga, so it wouldn't be surprising if there were at least that many in the anime. 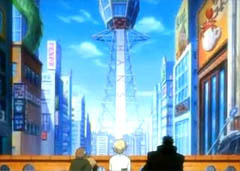 However, so far the running ‘Where’s Waldo?’ gag in the manga of having Miyuki-chan of Miyuki-chan in Wonderland appear in every world that Syaoran and company visit has not been translated to the television series. The anime appeals not just because of the characters, but also because of the music. Think .hack//SIGN, but with more of a choral feel and in Japanese. It's the kind of music that you could listen to for hours and not get tired of. However, not all tracks follow this pattern; there is a harsh battle music made up of whistles (think Gangs of New York). The opening and ending themes are very much different, yet they go perfectly with the series. BLAZE, sung by Kinya Kotani, is an upbeat example of J-pop at its finest. 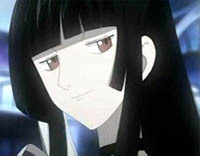 The ending theme, Loop, sung by Maaya Sakamoto, is a powerful ballad, with slight Celtic overtones and a gorgeous melody. One complaint about the series is that it's very serious and that much of the comedy found in the manga has been cut out of the anime, so fans of the manga may feel slighted. However, Fai still addresses Kurogane as 'Kuro-rin' and 'Kuro-chan,' and the ninja can't stand Mokona, so not all is lost in the translation from book to TV. 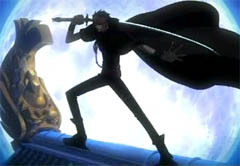 Despite differing slightly from the manga, Tsubasa Chronicle is sure to become one of the more popular series of 2005. As the manga is still running and shows no signs of ending soon, there's no telling how long the anime series is going to be. We sincerely hope that it will break the mold and become one of the longer series, giving the world a taste of CLAMP's finest creations remixed. Yet one thing many fans did not see coming was the announcement of a Tsubasa Chronicle movie! The theatrical feature, subtitled Tori Kago no Kuni no Himegumi (Princess of the Country of Birdcages) is being animated by Production I.G., with all the seiyuu from the series reprising their roles. It will be released in August with the movie xxxHolic: Manatsu no Yoru no Yume (Midsummer Night's Dream). The TV series ending theme Loop will be released in Japan in May, and the opening theme BLAZE will follow in June. A soundtrack to the series has been announced for July and first pressings will come with a pen made from one of Sakura's feathers.